​Barnhart Spinner was born July 4, 1835 in Rechen, Baden-Wurttemberg, Germany. His father was Anton Spinner was 27 at the time of Barnhart’s birth. Barnhart’s mother was Cleopatra Spaeth . She was 23 when Barnhart was born. Barnhart was the 3rd of 7 children born to Anton and Cleopatra Spaeth. Barnhart immigrated to the US in 1854. (Source 1900 Federal Census) He was naturalized on September 29, 1863 in Waukon, Iowa. Barnhart married Mary Elizabeth Goodwater on September 10, 1865 in Waukon, Iowa per the civil record. Barnhart’s obituary says the marriage was January 11, 1865. Mary’s obituary in the Ossian Bee newspaper says they were married in Lansing. Mary was French Canadian. Her father’s name was Benjamin Bonneau which he changed to Benjamin Goodwater. Mary’s mother was born in France, her father in French Canada. Mary and Barnhart had 14 children, 8 boys and 6 girls. The oldest , Mary Louise Spinner was born January 23, 1867. The youngest, Agnes Louise Spinner, was born August 8, 1888. In 1860, Barnhart was living with his brother Peter in Lafayette Township, Allamakee County, Iowa and was employed as a “day laborer”. Barnhart’s brother Peter Spinner helped teach Barnhart the blacksmith trade. In July 1863, Barnhart of Fayette, Allamakee County, Iowa registered in Dubuque, Iowa for the US Civil War Draft. From 1865 to 1867, Barnhart and his wife Mary lived in Lansing, Iowa. In 1867, they moved to the edge of Washington prairie where they farmed a year and then moved to Waukon, Iowa. By 1870, Barnhart was married and living in Waukon, Iowa in Allamakee County. He was the town blacksmith with a personal estate valued at $275. In 1880, Barnhart was farming in Bloomfield in Winneshiek County, Iowa one mile west of Moneek with his wife Mary and 8 children. Mary’s father, Benjamin Goodwater was also farming in Moneek. The 1880 agricultural census show Barnhart’s farm had 110 acres of “improved” land (80 tilled, 30 pasture) and 120 acres of unimproved property (woodland and forest). The farm was valued at $2100 and the livestock were valued at $1200. He owned 19 horses and 1 mule. Per “The history of Ossian and Military township” by C.C. Cornell and published by the Anundsen Publishing Company of Decorah, Iowa, in 1885, Barnhart Spinner was the Ossian blacksmith. In 1900, Barnhart was farming in Frankville Township, Winneshiek County, Iowa with his wife of 35 years, Mary and 3 of his children. The census states he and Mary had 16 children of which 13 were living. In 1910, Barnhart, age 74, was retired and living in Military Township, Ossian, and Winneshiek County, Iowa with his wife of 45 years and a granddaughter. The census notes Barnhart and mart had 16 children of which 12 were living. Barnhart’s immigration year on this census shows as 1857. 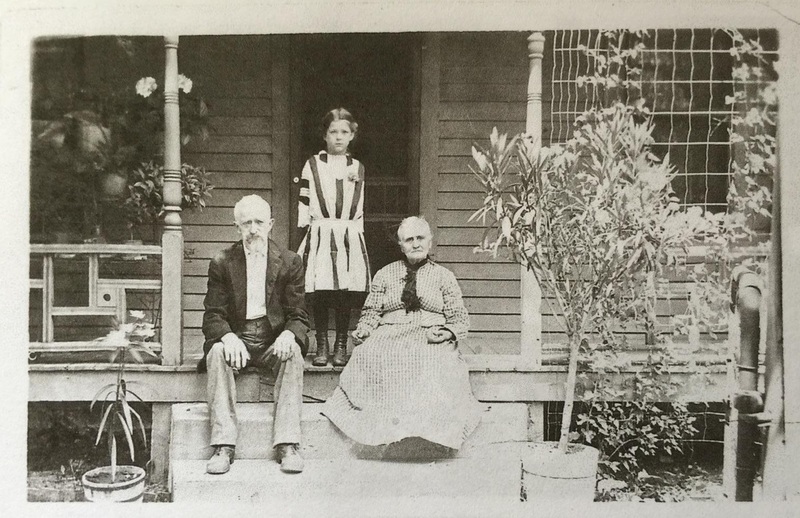 In 1920, Barnhart, age 84 remained retired and was living in Military Township, Ossian, Winneshiek County, Iowa with his wife Mary and one son. Barnhart died February 27, 1920 at the age of 84 years, 7 months and 26 days at his home in Ossian, Iowa and was buried March 2, 1920 in St. Francis de Sales Cemetery in Ossian. His wife Mary is buried next to him. Next to Mary Elizabeth Goodwater Spinner is Mary Elizabeth’s mother, Mary Louisa Carriere Goodwater Kunzelman. Barnhart’s will, filed March 4, 1930 leaves the bulk of the estate to his 12 children. Barnhart’s obituary was published in the Ossian Bee newspaper. The obituary notes he and Mary had 16 children, 12 of whom were surviving at the time of his death. Mary’s obituary notes they had 13 children, all of whom were living at the time of Mary’s death on January 27, 1929.